France Euro 2016: “group of death”? Tomorrow will start the UEFA Euro 2016. Fans all over Europe start getting excited by it. This year’s competition is played in France, with some matches taking place in Toulouse, one of them Spain – Czech Republic, which some friends and I will be able to watch live! This post is intended to be a quick one to discuss, as I did for the 2014 World Cup in Brazil, which groups are the most difficult ones, the so-called “group of death“. Media all over Europe states that it is group E, with Belgium, Ireland, Italy and Sweden the one which is the toughest. To discover which is effectively such group I’ll focus on a couple of rankings: FIFA’s and ESPN’s Soccer Power Index, as I did in 2014. C (Germany, Northern Ireland, Poland, Ukraine) with 3,897. F (Austria, Hungary, Island, Portugal) with 3,895. E (Belgium, Ireland, Italy, Sweden) with 3,869. F (Austria, Hungary, Island, Portugal) with 18. C (Germany, Northern Ireland, Poland, Ukraine) with 18,75. D (Croatia, Spain, Czech Republic, Turkey) with 20,25. And excluding the points of the favorite team in each group, which is the favorite facing the toughest group? Portugal in group F, facing 2,714. Germany in group C, facing 2,587. Spain in group D, facing 2,576. Then, combining the 3 approaches, to me, it becomes clear that the toughest group is F, with Austria, Hungary, Island and Portugal, by the total amount of points (2nd), ranking of the teams (1st) and in relation to what Portugal will face (1st). The second most difficult group would be C, with Germany, Northern Ireland, Poland and Ukraine, by the total amount of points (1st), ranking of the teams (2nd) and in relation to what Germany will face (2nd). You can see that, using FIFA ranking, and despite of conventional “wisdom” (press), group E would be nothing but the 3rd or 4th most difficult group, i.e. an average group out of 6. ESPN Soccer Power Index (SPI) ranking. ESPN Soccer Power Index (SPI) ranking was introduced by the economist Nate Silver of worldly fame, who many readers will know from his forecasts on elections in the USA (check his blog FiveThirtyEight). Calculate competitiveness coefficients for all games in database. Derive match-based ratings for all international and club teams. Derive player-based ratings for all games in which detailed data is available. Combine team and player data into a composite rating based on current rosters; use to predict future results. The main difference in relation to FIFA ranking algorithm is that it takes player-based ratings for those players who play in clubs in the Big Four leagues (England, Spain, Italy, Germany) and the UEFA Champions’ League. The player-based rating is merged into the national team coefficient. The player-based rating weighs heavily in national teams with many players playing in the main leagues (e.g. England or Spain national teams) and less heavily in other nations which roster is composed of many players not playing in clubs of the 4 main leagues (e.g. Russia). Other details of the ESPN’s approach are similar to those used by FIFA: e.g. giving weights to results depending on the opponent, measuring the competitiveness of the match, the different confederations, etc. ESPN provides a daily update of its ranking, however it includes only the top 25 world-wide teams, out of which 15 are European and only 13 represented in the UEFA Euro 2016, that is about half of those 24 competing. D (Croatia, Spain, Czech Republic, Turkey) with 309. B (Slovakia, Wales, England, Russia) with 307. C and E with 303. B (Slovakia, Wales, England, Russia) with 24. D (Croatia, Spain, Czech Republic, Turkey) with 24.5. E (Belgium, Ireland, Italy, Sweden) with 28. England in group B, facing 224. Spain in group D, facing 223. Belgium in group E, facing 219. Then, combining the 3 approaches, to me, it becomes clear that the toughest group is B, with Slovakia, Wales, England and Russia, by the total amount of points (2nd), ranking of the teams (1st) and in relation to what England will face (1st). The second most difficult group would be D, with Croatia, Spain, Czech Republic and Turkey, by the total amount of points (1st), ranking of the teams (2nd) and in relation to what Spain will face (2nd). You can see that, using ESPN SPI ranking (from October), and despite of conventional “wisdom” (press), group E would be nothing but the 3rd most difficult group. There you can see that with the latest ratings the most competitive group would be either D or C, very much like with FIFA rating (from June as well). It is interesting to note how by using FIFA or ESPN SPI the weight given to the group F (Portugal) is completely different. Finally, in both ratings the big absence in the tournament is the Netherlands, arguably about the 10-14th team in the world, the 6th in Europe. A pity for the competition. 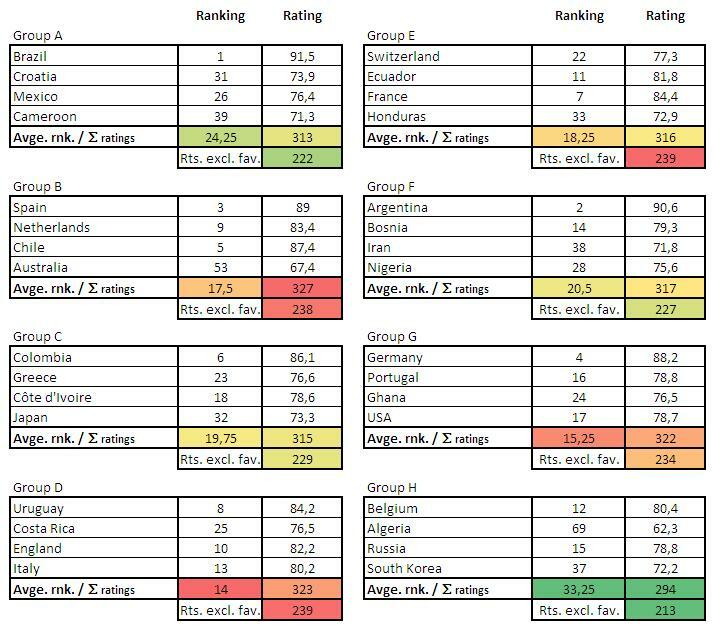 In a previous blog post I used FIFA world rankings to see which was the “group of death” of the following Brazil 2014 World Cup finals. 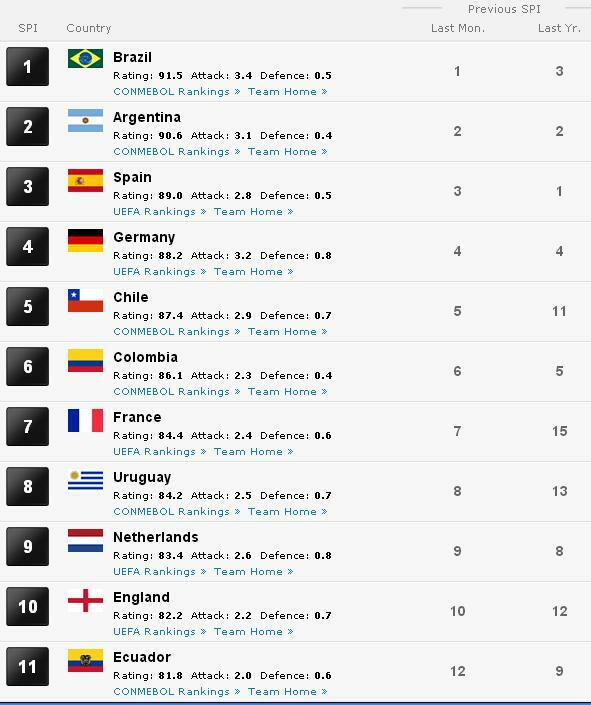 I received some comments questioning FIFA ranking based on the position of some specific countries: Switzerland, Portugal, Argentina, Colombia, Chile… I am sure that when one looks at how each country is playing he will believe that this or that country plays much better than the other placed higher in the ranking. But, the goodness of the ranking is that it removes perceptions from the process and simply establishes a set of rules by which all teams are going to be measured. It then goes on computing teams’ results along the year and the positions in the ranking are established, for good and bad. In one of the comments I received I got the suggestion to rather use ESPN Soccer Power Index (SPI) ranking. I was even more attracted to that hint as the ESPN SPI index was introduced by the economist Nate Silver of worldly fame, who many readers will know from his forecasts on recent elections in the USA (check his blog FiveThirtyEight). ESPN SPI ranking at the end of Nov 2013. You can see the top ranked countries at the picture above. FIFA ranking: 7 teams among the top 32 are not in the World Cup: Ukraine (18), Denmark (25), Sweden (27), Czech Republic (28), Slovenia (29), Serbia (30) and Romania (32). All coming from Europe, and not qualified for the World Cup due to the limited amount of places for UEFA countries (they all placed 2nd or 3rd in their groups). ESPN SPI ranking: 6 teams among the top 32 are not in the World Cup: Paraguay (19), Serbia (20), Ukraine (21), Peru (27), Sweden (29) and Czech Republic (30). 4 countries from Europe and 2 from South America, out for the same reason. Here however, Paraguay is still placed 19th despite of being the last country of the CONMEBOL qualifying. Brazil 2014 groups heat map based on ESPN SPI ranking. And then, the same analysis as in my previous post follows. B (Spain, Netherlands, Chile, Australia) with 327. D (Uruguay, Costa Rica, England, Italy) with 323. G (Germany, Portugal, Ghana, USA) with 322. D (Uruguay, Costa Rica, England, Italy) with 14. G (Germany, Portugal, Ghana, USA) with 15,25. B (Spain, Netherlands, Chile, Australia) with 17,5. And excluding the rating of the favorite team (pot 1) in each group, which is the favorite facing the toughest group? Uruguay in group D, facing 239. Spain in group B, facing 238. Germany in group G, facing 234. Then, combining the 3 approaches, the toughest group is between B (in terms of combined ratings) or D (in terms of average rating and from the favourite point of view). Using the ESPN ranking group G would definitely would not be the toughest one, but the 3rd toughest. I would understand ESPN journalists calling group B or D the toughest one. What strikes me is why FIFA website content editors call group B the “group of death” if by their ranking that group would be the group G! It will be interesting to see how one ranking fares against the other at the time of predicting the actual development of the Brazil 2014 World Cup. Brazil 2014 FIFA World Cup: “group of death”? The draw of the groups for the Final phase of the football World cup to take place in Brazil from June 2014 has taken place today. As it always does, it drew much attention and right afterwards lots of speculation, especially to identify which one will be the so-called “group of death”. Spain, the Netherlands, Chile and Australia will make up the proverbial ‘group of death’ at the 20th FIFA World Cup™, while Uruguay, Italy, England and Costa Rica will comprise another intriguing pool. Take a look at the groups in the picture. What would be your guess as to the most difficult or the easiest group? Brazil 2014 World Cup groups. I then decided to take a quantitative approach using precisely FIFA world rankings, a classification made up with the points each country is getting for their results every month. Take a look in the picture in the right, to see the FIFA rankings at the end of November, just before the draw has taken place. You will see Spain in the top spot with 1,507 points, well ahead of Germany, Argentina, etc. Most of the countries in the top 23 that you can see in the picture are represented in the World Cup with the exception of Ukraine. See the whole ranking here. With this information I built the following table, attaching to each country in the different groups the current ranking and points. Then, I calculated the average ranking of each group and the total amount of points. 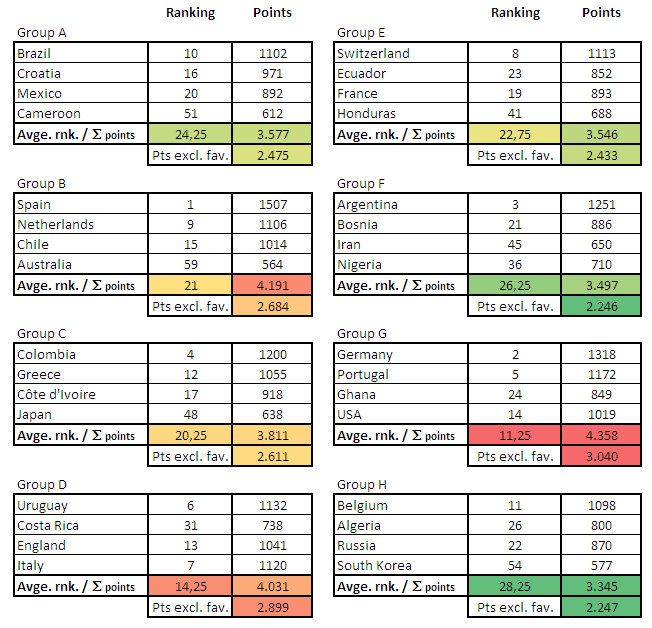 I then, also summed up the amount of points per group excluding the favourite in each group, showing in that way which has been the most difficult or the easiest group for the favourite countries (those placed in the pot 1 of the draw). Finally, I coloured results in a heat map: more red, more difficult. Which is then the “group of death”? FIFA 2014 groups heat map. G (Germany, Portugal, Ghana, USA) with 4,358. B (Spain, Netherlands, Chile, Australia) with 4,191. D (Uruguay, Costa Rica, England, Italy) with 4,031. G (Germany, Portugal, Ghana, USA) with 11,25. D (Uruguay, Costa Rica, England, Italy) with 14,25. C (Colombia, Greece, Côte d’Ivoire, Japan) with 20,25. And excluding the points of the favorite team (pot 1) in each group, which is the favorite facing the toughest group? Germany in group G, facing 3,040. Uruguay in group D, facing 2,899. Spain in group B, facing 2,684. Then, combining the 3 approaches, to me it becomes clear that the toughest group is G, with Germany, Portugal, Ghana and USA, by the total amount of points, ranking of the teams and in relation to what Germany will face. Then, I would say that the second most difficult group is D, both looking at ranking and from the point of view of Uruguay. The third being group B (though between D and B, depends on the approach). On the other hand, for the Netherlands, Chile and Australia (the worst team of the competition) it is clear that group B is the most difficult, as from their point of view their group has the most points excluding themselves (mainly thanks to the 1,507 of Spain). Finally, after having done the analysis and seeing the heading of conversations on groups’ difficulty are taking I realize how few people have read about “Soccernomics” or “Moneyball“… just like with stock markets, at least this is just football.